Coraleigh Boyle and Clay London were once the closest of friends, on their way to becoming much more. Estranged for years, they finally agree to meet for a simple lunch but passion threatens to ignite anew. 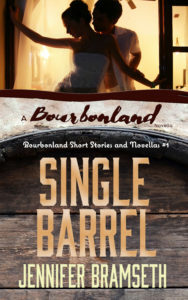 Single Barrel, a novella, is the first story in the Bourbonland Series of short stories and novellas and the first story in the Bourbonland world. Coraleigh and Clay are important, reappearing characters in every Bourbonland work (novels, novellas, and short stories) published to date and will eventually get their own book. If you’d like to read more about their creation, check out this post. This 25,000-word novella is available for free to my newsletter subscribers. You can sign up here (and you’ll get several freebies besides Single Barrel). Her heart skipped a beat at the question. She thought every time would be the last time. It should’ve been. But time had repeatedly shown her to be a fool. She always would be for him. And how could he not remember? Had it really been that forgettable for him? Coraleigh looked out the window of the small diner in Bourbon Springs and into the grayness of a November afternoon. Little chance they’d be recognized here, although it was possible. But home was several counties away for her, and even farther for him. The place was packed, however. Hardly private. Not the best conditions for the kind of conversation she expected. Then again she hadn’t expected to have this meeting with him. But when he had called and she heard that broken, haunted voice—well, she wasn’t going to deny him.